The first thing you need is a decent camera. These days, nothing comes close to a digital one, which will immediately allow your child to see what he or she is doing wrong – or right. If you feel like upgrading your own camera, pass the old one on to your child. If you choose to buy a new one, remember to invest in a longer warranty that will cover accidents, as they do happen! It's not worth spending a lot of cash until your child proves that this is not just a passing fad, and is capable of using all the many functions. These days, you can buy a decent digital for about £50. For smaller children beginning from age three, a special children's camera may be more appropriate. They are easier for tiny fingers to use, look glitzier to keep their interest, and are more durable. Don't expect the quality of the photos to match those taken with an adult camera, however, or you will be disappointed. Once you get the camera, the best way to get your child interested is to narrow down their interests by picking a photo topic. It can be babies, crowds, trees, animals – anything at all. Let them choose the topic on their own, once you go through the camera basic and rudimentals of taking a good photo (see top tips for shooting, below). Some children, especially younger ones, will benefit from being given tasks they need to complete. They will love the feeling of searching out the best subject and accomplishing the given task at hand. The task could be as easy as finding ten animals to photograph during a day out at the zoo, or as complicated as finding ten children with red balloons. Once your children complete their first subject series, why not buy an affordable photo album and make a keepsake? The beauty of digital cameras is that you can choose to print only the best. Younger children can decorate the album with stickers and drawings to make it extra special. 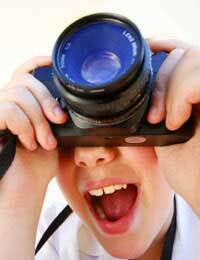 All photographers love to showcase their works, so why not have your children showcase theirs? Le them choose 15 – 20 photos they especially love, mount them on card and stage their very own exhibition. You could even get the local newspaper involved! Children could also create a set of themed exhibits and set up their own gallery. Even if the only visitors are Grandpa and Grandma and Mrs Higginbottom from down the road, creating a gallery is fun and will motivate your child to keep on taking more and more photos. Get a little bit closer. How often does a photo turn out badly because the photographer is standing too far away from the subject? Try to get down on their level. Pictures look better when you take the time to crouch down to really capture an image. Know your flash's range, and use it outdoors as well as inside. Catch the light. Summer is a great time, but twilight hours also make great photos. Be your very own producer. Don't be afraid to ask your subjects to move the way you want, and to place people in positions that look better. Be creative. Putting incongruous items and subjects in a photo will add to the charm. Encouraging your children to become amateur photographers when they're young could set them off on a lifetime hobby – or even a profession. And the excitement of taking their camera with them when they go out, even to such a mundane place as the supermarket, could also make your own life a lot easier this summer!